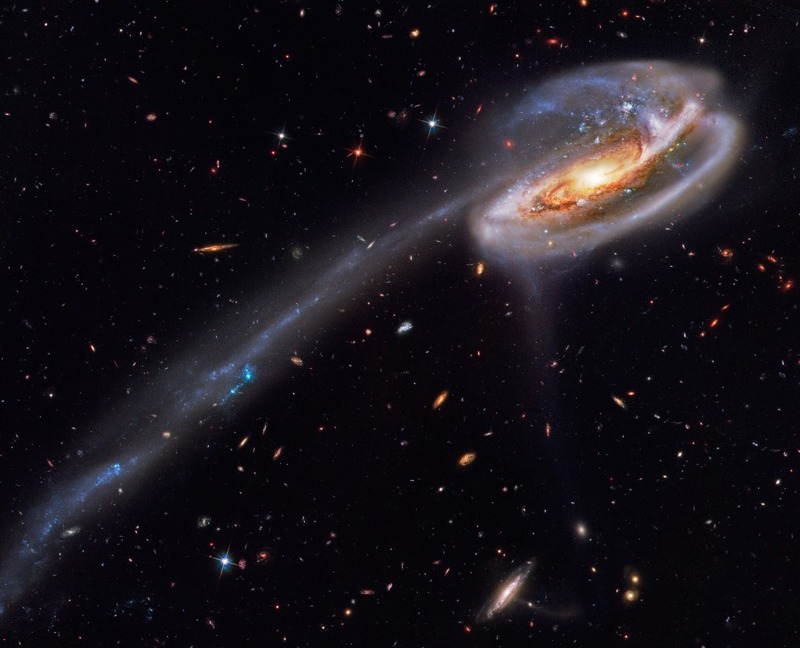 This is the Tadpole Galaxy. It is about 420-million light-years from Earth in the constellation Draco; while it measures in at approximately 390,000 light-years across. The Tadpole gets its iconic shape from interacting with a smaller, more compact galaxy many millions of years ago. You can actually still see the galactic nucleus of smaller galaxy. Furthermore, If you find the nucleus of the large galaxy (near the center of the tadpole), up to the right at about a 45 degree angle is the second nucleus, seen as the largest of the three small white clusters. Of course, the tale is caused tidal debris from caused from the gravitational forces of the interacting galaxies. The tail itself is more than 280,000 light-years long and contains several star clusters. These clusters contain about 100,000 stars each; the stars themselves are much more massive and far hotter than our own Sun. I would be doing you a disservice if not to mention the stunning collection of background galaxies visible in this image. You can see galaxies from the current epoch – large and ordered, all of the way back to the infant small, irregular galaxies of the early universe. You can download a larger image here.